US Hands Off North Korea! Award-winning author, Professor Emeritus of Economics at the University of Ottawa, Founder and Director of the Centre for Research on Globalization (CRG), Montreal, and Editor of Global Research. Retired U.S. Army Colonel, who resigned in protest of the 2003 US invasion of Iraq. International leader in the antiwar movement, Veterans for Peace and CODEPINK Women for Peace. Part of 2015 Women Cross the DMZ, which featured peace conferences in both North and South Korea. It is clear this meeting will not discuss U.S.-led aggression, threats, and sanctions against North Korea. Rather, it has been called to further attempt to isolate and demonize North Korea and to bolster U.S. and imperialist interests in the region. 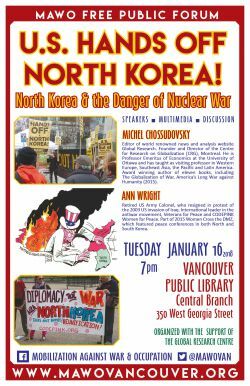 Mobilization Against War and Occupation (MAWO), in collaboration with the Centre for Research on Globalization (CRG), invites you to join our own meeting on North Korea in Vancouver on January 16. We will feature an important anti-war lecture and discussion on the roots and consequences of U.S. and United Nations sanctions and threats against North Korea featuring world renowned Professor Michel Chossudovsky. This event will take place on the traditional and unceded territories of the Tsleil-Waututh (səl̓ilwətaɁɬ), the Musqueam (xʷməθkʷəy̓əm), and the Squamish (Skwxwú7mesh) Coast Salish Nations.